Music, art and theater are healing devices, according to James Earl Jones II, the triple-threat performer currently playing in Porchlight Music Theatre’s production of Kander and Ebb’s The Scottsboro Boys. Diagnosed with Tourette’s Syndrome as a child, Jones early goal was to become a doctor. That plan changed and Jones received a scholarship to study opera at the University of Illinois Urbana-Campaign. Theater and dance followed, and a decade later, the multiple Jeff nominee has been at home on dozens of stages in a wide range of roles. The impressive list of his Chicago and regional credits includes the title role in the world premiere of Carlyle and a superb turn in a featured role in Wonderful Town both at Goodman Theatre last season. He has also appeared in Sondheim on Sondheim at Porchlight, Dreamgirls and The Full Monty at Marriott Theatre and numerous other productions at Court Theatre, Chicago Shakespeare Theater, Writers Theatre, Lookinglass, Drury Lane, Northlight, Ravinia and Broadway in Chicago. His operatic credits include the Lyric Opera of Chicago, San Francisco Opera and in a national tour of The Gershwin’s Porgy and Bess. His television and film credits include Pokerhouse, Chicago Fire and Empire. 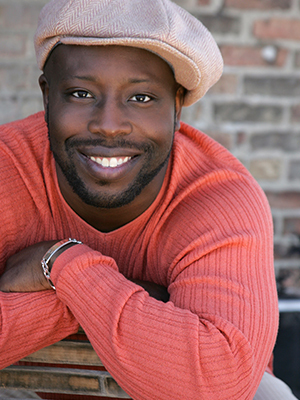 His work has been recognized by the Black Theatre Alliance Awards and Black Excellence Awards. James Earl Jones II joined the Conversation on February 15th for a frank and open discussion about living with Tourette’s and how the musical of The Scottsboro Boys story helps to broaden our understanding of a very dark and tumultuous time in our history. JAMES EARL JONES II & ENSEMBLE SING "GO BACK HOME"
Kander and Ebb’s The Scottsboro Boys, now playing at Stage 773 through March 12th, is based on the true story of nine black youths accused, convicted and imprisoned for crimes they did not commit. James Earl Jones II, in the role of Haywood Patterson, leads the company in Go Back Home. The brilliant ensemble performances of the Jeff recommended Porchlight Music Theatre production, all housed in the context of a minstrel show, combine to tell a stark and tragically compelling story of the boys harrowing journey of racial injustice.